Most people would describe me as someone who is more likely to break the rules than follow them; life sure seems to be more interesting that way. Surprisingly though, I do tend to be conventional, except when I am not. Thanksgiving is one of those exceptions. Growing up, Thanksgiving was an extravagant holiday in our house, as I’m sure it was in the homes of most around me. They are memories that I will always cherish. My Mom got up at the crack of dawn to make m sure we had a fully glutenous meal. In the evening, she wore her hair in an up-do that made her look like a movie star. We dressed up in long skirts of velvet and lace, with the men in proper suits of leisure. As I grew older though and went off on my own, I never really took to cooking Thanksgiving dinner, although I still held the holiday to be special. My first turkey was a disaster, despite desperate calls for intervention from “the Moms.” Tom happily snacked away on the shrimp dip served with Nabisco Wheat Thins while I flailed around in the tiny kitchen. The recipe was passed down from my Mom and immortalized in the pages of my first, and only, cookbook effort, Junior Achievers Cook. As the years passed and I became more obsessed with food and cooking, Thanksgiving came to feel more like a chore than a celebration. I know it seems that I would embrace this kind of cooking, but I became less and less impressed with the effort-to-result-ratio (not to mention the ratio of food to plate). My sister-in-law Christine and I use to joke that we were just going to fly in Lucky Wishbone fried chicken the following year and skip all the fuss. We never did though, and each year it would take place all over again. Tom and I decided to take tradition into our own hands and move the holiday south, and off the Mainland. We have abandoned turkey (except in a sandwich on the beach the day after) and replaced it with fresh-caught fish instead. This year it was opah, which was so fresh it felt as if we had pulled it from the sea ourselves (luckily not, visions of Tom flailing about in sea is not a good thought). But, cooked under the stars with the waves crashing to shore just 20 feet away, smells of salt and sand mixed happily with the smokey perfume of the fire. If you have never cooked over coals on the beach, this is something not to be missed. I made a simple stuffing earlier in the day along with fresh green beans, cooked just-barely, then tossed with olive oil, lemon and almonds. I admit, I bought the fresh cranberry sauce this year as I usually make my own while the stuffing cooks (in between sips of Prosecco and bites of breakfast). The whole dinner, plates, utensils, food and all, fit perfectly into a small plastic file tub that also acts as a great side table in the sand. The sun had been so orange and solid tonight that as it set, it felt as if a whole universe had disappeared before our eyes, right into the sea. The sky lit up colors of purple and red, casting light well into the evening. Up and down the shore, families were walking back from dinner at the neighboring hotels. We settled into our usual spot, surrounded by all the comforts we could ask for, poured a cocktail and enjoyed an array of vegetables so fresh that nothing else was needed to kick-off our dinner; no nut-crusted cheese-balls, cheese cubes, crackers, shrimp dip, or parades and football on TV. As the colored sky faded, we began to notice rhythmic lights as more families streamed by (or was it just clumsy walking in the sand?). Cocktails turned to wine and the charcoal went from cold to hot. Sparks spat up like fireworks as if to acknowledge both Thanksgiving and Tom’s birthday all at once. I filled our plates, just enough, sat back and enjoyed a most exceptional meal. It is not the turkey that makes Thanksgiving, it’s the moments and relationships that we are thankful for. Brown the sausage in a sauté pan, no oil needed, set aside. Sauté, in the same pan with olive oil over medium low heat, the leeks, mushrooms, celery and carrots (approximately 5 minutes). Remove from heat and add the sausage back; then the whisked egg, salt/pepper and liquid (just enough to moisten). Transfer the whole deal to a buttered casserole dish (notice how I found a sweet one in Gramps’ Hawaiian cabinets dating back to my youth (so classic Mom)! Add the kale and gently mix. Cook in a 350 degree oven for about 10 minutes. This will cook through all the contaminates (health dept. warning) allowing the finishing touch to occur on the beach grill. Finish the night with a shot of espresso (in those l’il metal old school Italian stovetop makers), boiled on the hot coals and a bite of dark chocolate; no pie required. I recently came across a photo that must have been taken when I was eight, maybe nine (heck, maybe seven); I am guessing my age judged by the outfit I was wearing which included, mis-matched plaid, an orange down vest, given to me for Christmas and a pair of black waders, striped on top with the standard maroon ring. Did I mention this was Alaska? I was standing on the deck of a boat next to my brother Scott, looking a little scrappy and somewhat tomboy-like (to do with the hair and the outfit but most importantly, the twinkle in my eye as if to say, “I have conquered the world”) holding the legs of a freshly caught king crab. Admittedly, I don’t remember doing this and am not sure where in Alaska we were at the time (although geography lessons did give me a clue, but I’m gonna keep you guessing). We were always traveling somewhere around the state; sometimes in a Winnebago (probably haven’t heard that word in a while) borrowed from my then orthodontist, Dr. Mirrors, who traded braces for me and my brother’s teeth in exchange for law services from our father. I didn’t much like this set of wheels because the inside seemed a little grungy (only to me), and orange (it was the seventies), but I was given the upper bunk over the cab which was a great place to escape and read my books. Dad, a closet photographer, yet actually big-time lawyer, was in awe of Alaska’s beauty and would constantly nag us to look out the window at the scenery (something Tom does to me now, come to think of it). I wish I had done more of that then because in the earlier days, the enormity of the land was quite spectacular, and the things I probably missed are things that can’t really ever be seen again; in the same way, that is. Mom collected wildflower along the way, leaving them to dry in between the pages of a book, while Dad took way too long trying to capture the perfect photo, and Scott and I secretly enjoyed paling around the outdoors, skipping rocks and hiking through the trails (we left the bickering at home on those journeys). I digress though, as I am really here to talk to you about king crab (and spot prawns). As I mentioned in my previous post, the end of one thing leaves way for the start of something new. Halibut will leave us soon to appear again next Spring, but fresh king crab and spot prawns are here to ease the pain; momentarily anyways. Tonight, last week, and perhaps one more time this year (I said perhaps, and then knocked on wood) there will be fresh king crab! For those that are going to be around Seattle for Thanksgiving, rumor has it that Gemini is bringing in more fresh king crab for the holiday. As for us, the beach is calling and our fresh catch will be tropical. I might have mentioned, but can’t recall, that seafood was not something that had me running to the table (or camp site) as a kid. I partly blame this on the fact that Dad didn’t much care for salmon, Mom usually over-cooked it (and I won’t even mention the salmon patties…), plus there was a Tasty-Freeze around the corner from where we lived. Oh, and don’t forget, I did have my fried chicken. Dad also used to have a client that owned a seafood plant. 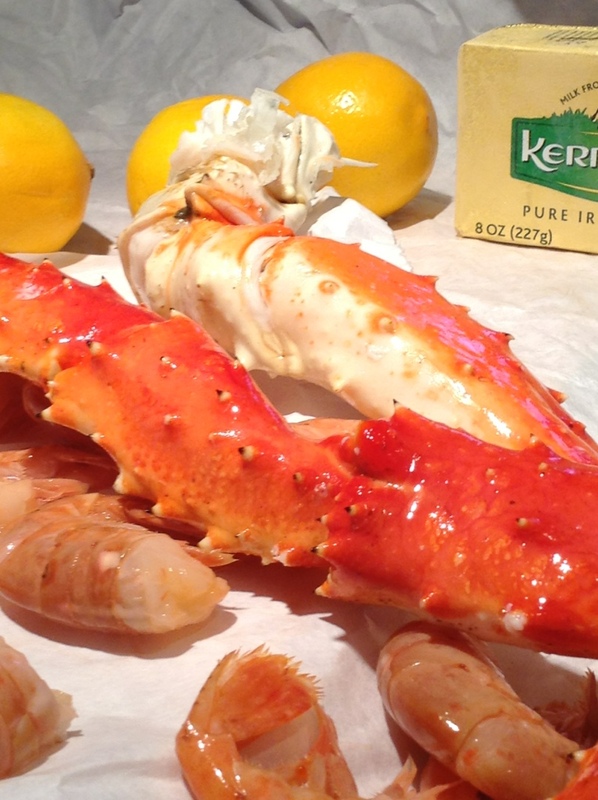 This client would gift him large quantities of Alaskan king crab legs every year. Now this likely was the real deal, but I was too young to know fresh from frozen. I do however, remember it was succulent and delicious; when we got this, it was always very special and fell easily into melted butter, followed shortly by my mouth. My most recent memories of this client’s generosity come from my late teens, yet mostly from my early twenties. My Dad and Step-Mom, Linda, would always host Big Dinners. When I came home at the holidays, I looked forward to the solitude of reading full novels (not just a page or two), skating on the lake behind our house, spending time with family and friends (often seated around a table at The Lucky Wishbone) but with anticipation, I looked forward to the Big Dinners that Linda would prepare. Beyond the paella, Peking duck (Linda’s tradition for her friend and Dad’s ex-law partner Flint), grilled leg of lamb (grilled outside, caught between the indoor fire and several feet of snow), and whatever epiphany or disaster ensued, there was the king crab feed, which often extended to include spot prawns as well. Newsprint spread across the vast mahogany table, candles filling the large room with flickering light and lucky diners accounted for, a casual tradition would unfold, becoming festive in its’ lavish humbleness. The simple act of peeling away the thorny armor, digging it out (intact and in large chunks) from its’ protective shell, to be bathed in a hot vat of butter or swirled dreamily through a creamy whip of garlic, egg and olive oil, married the simplicity with the splendor. There were the implements, such as crab-crackers, scissors, and tiny forks. Other sauces such as cocktail, horseradish, and hot, garlicky butter. There was music (Bing Crosby, Frank and Peggy Lee), pre-dinner appetizers, cocktails and wine. Sometimes there were artichoke hearts, whose leaves could peel away and share a dip in both the butter, and the aioli that was set out for the seafood. If I had known Tom back then, he might have asked to marry sooner, but he definitely would have chosen butter for his crab; for me it was aioli. Gotta have the aioli. This time of year (at least this year) in the Pacific Northwest, I cook up a two-person-plus-two-pup kind of feast. Music plays, but it always plays; jazzy tunes, old classics, blues, or that chill kind of stuff that Tom is into. I am dressed up in my pj’s rather than to my nines, but nobody’s going to judge me – tonight. Crab will be cracked, spot prawns peeled, and a messy feast will be had (in really, a not so Whoville kind of way). For the crab, you can steam it, eat it room temperature or eat it chilled, but however you choose to do it, eat it fresh – or not at all. For the spot prawns, I usually like to cook them in my wok over high heat, shells and all but tonight, sticking to tradition, I decided to boil them the way Linda taught me, in water, ale and Old Bay Seasoning. I am a big fan of cocktail sauce (Tom is a big fan of my cocktail sauce); I make it with a bit of a twist. Once when I was working at Etta’s, one of the cooks came from behind the line and took a scoop of the espresso grounds and added them to her bowl. Curious, I asked what she was doing, and was told that espresso grounds got added to the cocktail sauce. Back at home, I began adding it to my own recipe and have never looked back. It adds marvelous depth and complexity. In a medium bowl, mix together 1/2 cup ketchup, 1/4 cup chili sauce, 1 heaping tsp prepared horseradish, 1 TB Worcestershire sauce, 1 TB lemon juice, 1 TB chopped shallot, 1 TB used coffee grounds, 2 TB fresh chopped cilantro. Add Tabasco sauce to taste and the adjust seasoning as needed. Simple Simon, quick and easy (to make it even easier, I never ever measure the ingredients – I just adjust as I go). The traditionalist that he is, Tom likes his crab dipped in butter. Quite honestly, with crab this good, no sauce is required but I make this for him every time nonetheless (although he dips into it fewer times than he used too). Combine, in a small saucepan, approximately half a stick of butter, 1 clove chopped garlic, juice from 1 slice of lemon, and 2TB white wine. Keep it over medium heat, stirring, until the butter has melted. To serve, divide among individual ramekins set over a flame. I use this for up to four of us, easily could be doubled though. To make individually, simply put a TB of butter, a little chopped garlic, and a few dribbles white wine in each ramekin. Melt this in the microwave and squeeze in a little lemon juice. I usually add some fresh chopped tarragon to mine but Tom prefers his without (and he would assure you, this is damn fine). It seemed harder to awake today then it did this time last week. I am awake but not yet wanting to be awake. I think of things like – work. What must I remember and in what clothes will I need to dress? Jeans might be my friend. Summer seems like yesterday, or at least just weeks before. The days are growing darker though. And colder. More wet – and now filled with ochre, mustard and rusts. No more shades of green; at least not the bright and happy shades. As the leaves keep coming down though, they threaten to strip bare all the color, exposing branches, open sky and a scattered mess of the backyard beyond our fence. It reminds me, we forgot to buy bamboo to fill the voids that will soon become our view since the beautiful, old growth trees next door were taken down. They have left a void which will need, slowly, to be built back up with new growth, new life and new beauty as seasons pass. I am also reminded that somehow I missed August; perhaps buried in work instead. I neglected to buy a crate of nectarines for freezing and an extra bag of cherries to make a batch of sauce. The cherry sauce I like to pair with Christmas fish or a thick loin of venison at the new year. I didn’t fully enjoy the summer crop of tomatoes this year, something that usually brings me enormous joy. Eating them sliced with only the grain of one large sea salt flake crumbled beneath my fingers to coax out the intensity that could also, easily be enjoyed with none. Mixing them diced, into a bowl with olive oil, flavored lightly by garlic, basil and chilies. I can eat this by the spoonful but might share it with a bowl of homemade pasta too. I missed signs that farmer’s markets were winding down. Old news now but I was absent for the last few. I must have been resting my tired body instead trying to cope with the hectic weeks that left me feeling drained. I missed out on the perfect egg, pints of berries, blossoms – of zucchini and loads of satisfaction. The kind of satisfaction I get from feeling my bag pressing downward toward the ground as it fills up with our weeks’ dinner. The kind that leaves me connected to the community and to the food on my plate. That of sitting down to the perfect meal, the ordinary meal or just cooking something fresh for someone I love. Not the kind of satisfaction that comes from a job well done. With that comes the exhaustion. I visited one of my completed projects this week to oversee the last of the late installations. I thought I would feel more satisfaction from the closure but it conjured up exhaustion instead. All the time spent orchestrating each experience, fretting and caring about every detail, every choice, every outcome. What does it all mean in the end? I like to hope that the passion I put into my design work results in equal amounts of meaning to those who experience and live in the spaces I help to create for them (as I know it does when I cook). Perhaps that is why I love to cook. The process is therapeutic in its’ execution. It is creative, fulfilling and short-lived. And at the end of a meal I can know that I have shared a part of me with people that appreciate my efforts, long or short as the efforts might have been. Each taste and every flavor stays with me and helps me understand nuances of improvement that are easy to explore again; as long as I don’t let the season pass. Somehow, as this season passed, I absently neglected to fill our plates with fish. December will creep in quickly now even though last I blinked it was only June. Perhaps I missed July as well. Halibut is going into hibernation soon; at least the fishing for it is, which means I missed another season. We’ve had it only twice this year. Not counting the freshest catch that filled our plates so often in the first weeks of May and the last of April. I do love true cod more, but there is something about the retreat of halibut that sends me into cravings for its’ clean and mild flavor, its’ delicate, flaky meat that if treated properly slides off your tongue leaving a feeling of happiness. If cooked too long though, tastes of flavorless chicken instead. I thought I missed my chance as October turned to November and the weeks went by again. Gemini claimed to have some in this weekend though, of the same caliber as that which we gobbled up this spring (my favorite time for fresh halibut and salmon). I put my dibs on enough for dinner, yet walked away with a little more (perhaps Buddy or Ginger called it in). 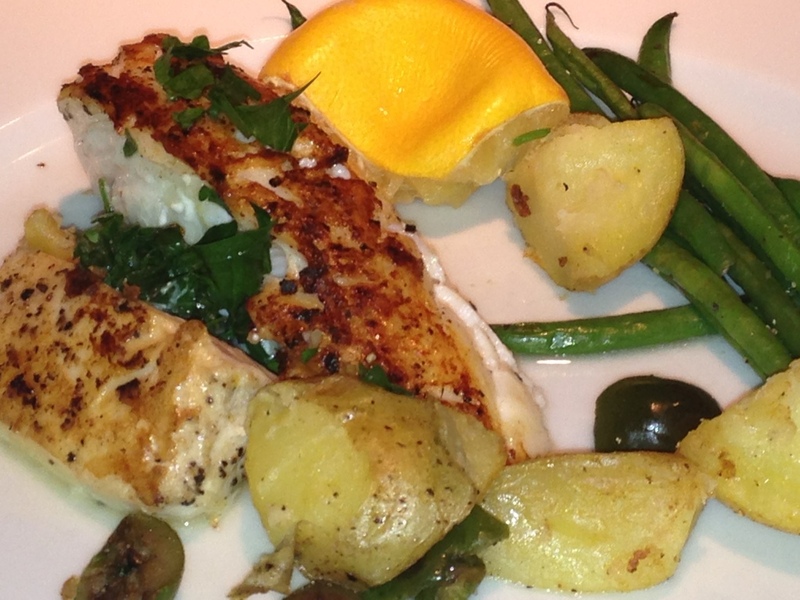 The halibut was every bit as good as promised; coming from Gemini, it always is. As we sat down to dinner last night, I bit into a little taste of Spring. I closed my eyes and let its’ flavor conjure up new beginnings. Spring will come again next year so, for now, I must concentrate on Fall. Luckily, the end of halibut gives way to other treasures from the sea. 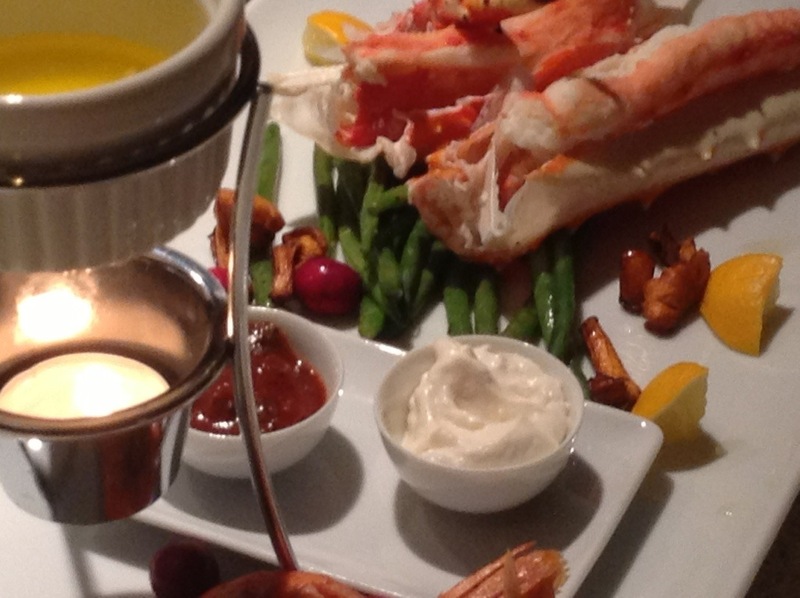 Tonight we’ll feast on crab… and prawns (yes, three fish in the basket again). Not as ordinary as it might sound. These are from Alaska, yet being from Alaska, I never ate the likes of these. 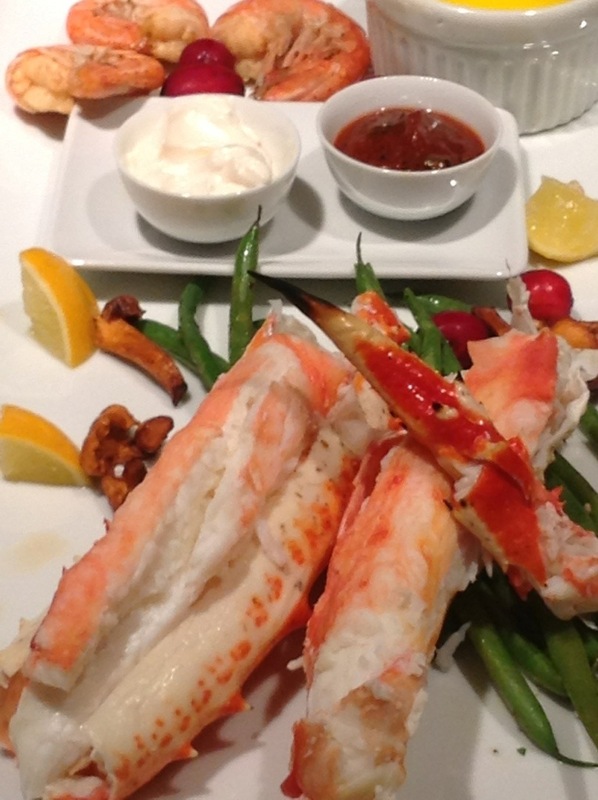 Fresh king crab, never frozen; after trying it years before, I have never settled for frozen Kings again. Fresh spot prawns will accompany the crab so I hope Jeff and Linda will join me for my next post in recollecting these rarities of the Bering Sea. …which, by the way, was seared in olive oil after being well dried with kitchen towels then seasoned with sea salt plus fresh ground pepper. Stars aligned, it did reach the perfect temperature before being flipped quickly onto the other side to cook briefly, in the oven, before being slipped onto warm dinner plates. 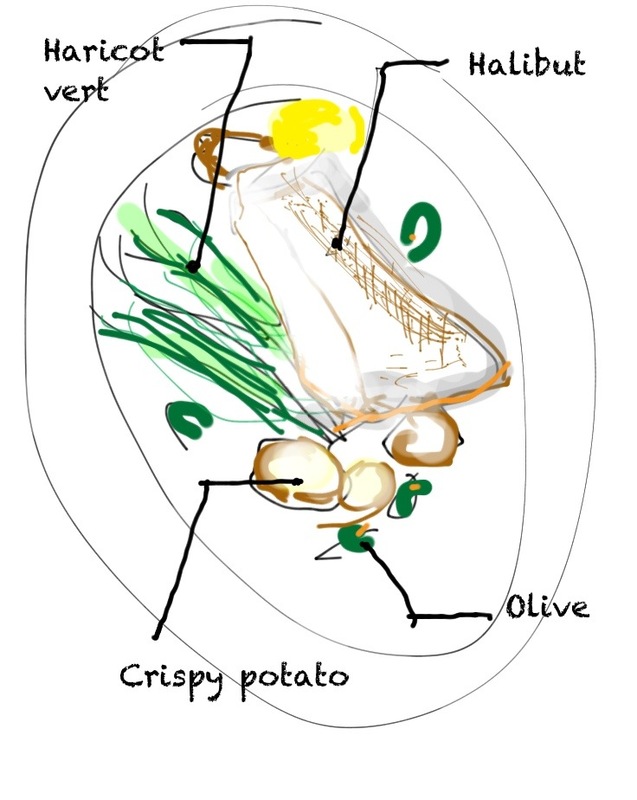 The plates were dressed with crispy potatoes, Castelvetrano olives and parsley; all doused together in lemon juice; haricot vert cooked just crisp-tender laid beside. A simple prep for a complicated day; hopefully this leads the way to a restful weekend. Buddy barks, walks to the kitchen and expects me to follow, each time he turns to retrieve me, he makes it one step less, back to the kitchen, before repeating. Tonight we have braised lamb shanks heating in the oven but it could have been seaweed, okay, not seaweed but surely something of lesser interest because he isn’t in a discerning state right now. He is convinced he is hungry (all in his head) and notes I am taking a break. Actually he, more likely, suspects he has missed our dinner altogether, perhaps in between naps. Why else would I be so relaxed away from my post in the kitchen? It doesn’t matter that they have been sufficiently fed (both with raw bison, dry duck & potato kibble, not to mention the cruet bowl typical at happy hour). They have been outside twice, sniffing, rummaging and doing their business in the yard. Two minutes ago they were angelically settled in on the couch as if they had already brushed their teeth and slipped into their footsies to watch a little show before bed. Stan Getz was serenading us from the HiFi as Tom and I caught a moment of pause; we were not quite ready to eat. Apparently too much time had lapsed between courses for Buddy though because nanoseconds after I had had this thought of angels, I heard the lil’ devil bark. Buddy has made it a new habit to use his voice in trying to get me to obey. It used to begin silently with Buddy at my feet, a tilt of his head, one ear cockeyed and eyes begging me to follow. Next came the sound of his toe nails scurrying to his bowl. Then back to my feet. A small squeak would escape in case I hadn’t noticed him as he ran back to the kitchen. When I don’t make a move, he returns, short stubby legs wobble beneath him as he musters the loudest plea he can make, then retreats once again. Tonight, he skipped to the end and went from sleeping to barking without all the foreplay but each time he retreats, he makes it one step less to the kitchen, as if in disbelief that I sit unmoving to appease him. Yet, I do always appease him, in the end. Growing up, lamb was my all time favorite thing which, I guess, is a little odd for a kid who was not a particularly good eater. Every year I look forward to Whole Foods bringing in Icelandic lamb; it is quite lean and has a clean, delicate flavor. I usually buy it every week until it is no longer available. For those that don’t like lamb, you should give this stuff a try and you might just be surprised to find that you like it after all. Do try to buy grass fed; If using a fattier lamb shank, you might need to de-fat the liquid that becomes the sauce. Lamb shanks – 1 per person – this recipe will handle between 2-4. 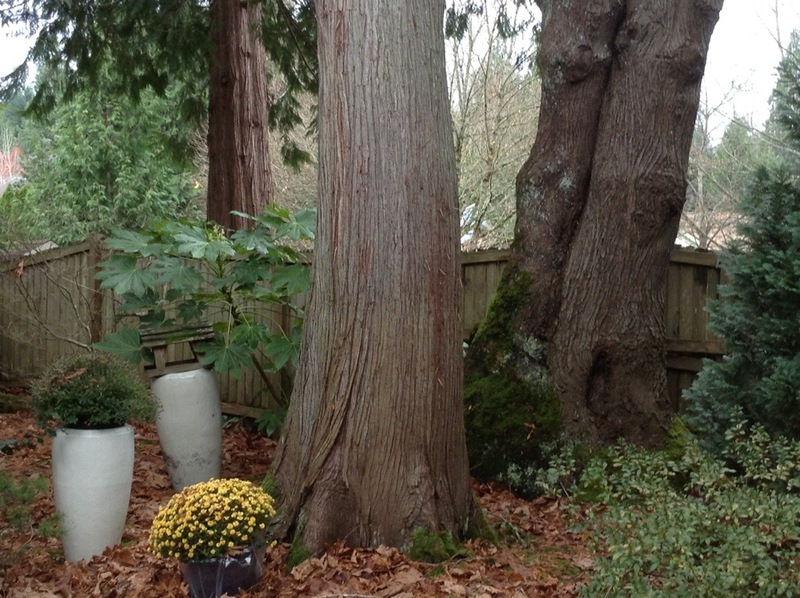 With a big enough pot and slight alterations to quantities, you could certainly do up to 8. Season the lamb with salt and pepper. I actually use a meat seasoning that I make myself by roasting black pepper corns, coriander seeds and Malden sea salt and grinding them with a mortar & pestle. Rub the seasoning into the meat and then rub over the Dijon, massaging it in as you go. Heat a large, shallow Dutch oven over medium heat then add the oil, heating until it glides freely over the bottom of the pan. Dredge the lamb in flour and brown on all sides. It is important to let the lamb brown, undisturbed until it releases itself from the pan without tugging; this will be several minutes so be patient and make yourself useful doing other prep or relax with a glass of wine as you watch over it until it is ready to be turned. Repeat until all sides are brown. Deglaze the pan with the vermouth. I really like this part. The liquid hits the pan with a large burst of noise and sets off an exciting puff of steam that makes my heart skip a beat thinking the pan will explode, yet before I can even finish this thought, it tames itself and threatens to disappear. 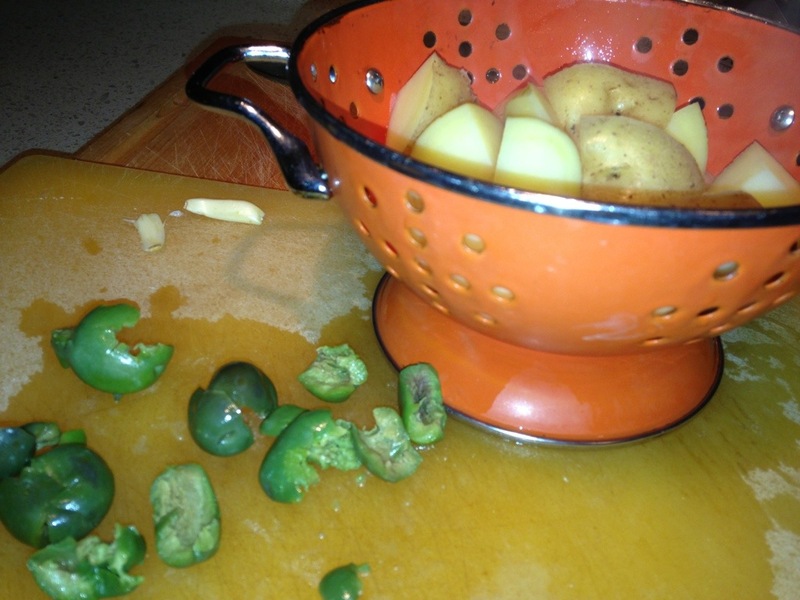 You must work quickly to scrape the bits from the bottom of the pan, then transfer it to a plate, juices, bits and all. Wipe the pan clean and repeat with the heat and the oil. Add the chopped onion, carrot, fennel fronds/stem, garlic and jalapeño. Work this around the pan over a medium low heat for about 10 minutes until the vegetables become somewhat tender. Squeeze in the juice from the lemon and add the rind into the pan. Toss in the tomatoes then pour over the vermouth and stock. Bring this to a simmer then put the lamb on top, pouring over any juices that pooled under the lamb. Now you have a few choices: add the carrots fennel and onion halves now (which I am inclined to do), or wait until near the end of cooking time. Either way, you can remove them when they are cooked to the consistency you most prefer. I like to pull my carrots out before they become so soft that they can be mashed. I like leaving the onions and fennel in almost to the end so they are really meltingly soft, but I do pull them out after a few hours so they don’t melt into the liquid but rather still retain enough structure to hold themselves up on the plate. Sometimes I like to keep my fennel on the crisp-tender side. In this case 1/2 hour in the oven is all that is needed then a little time on it’s face in a pan of butter to caramelize the top; for purposes of today though, soft and silky. I know, you are already cooking but up to this point I consider it still prepping because that was the do ahead part. Top the dutch oven with a lid and transfer it to a 300 degree oven. Keep your eye on the lamb; every now and again peek under the lid. You can baste the meat with the liquid or poke it around a bit. Three hours (+/ -) it should be meltingly tender, so if your poking around reveals that this time table is on track, consider adding the fennel, carrots and onions 2 hours into it (if you didn’t do it up front). This will give you enough time to have them cook nicely but not melt away. Remove the lid for the last hour so that the meat develops a nice color. Just keep your eye on it once in a while so you don’t lose all the liquid; add a little water, stock or vermouth if needed. Remove the pan from the oven and separate out the large vegetables and the lamb on a plate or shallow bowl. 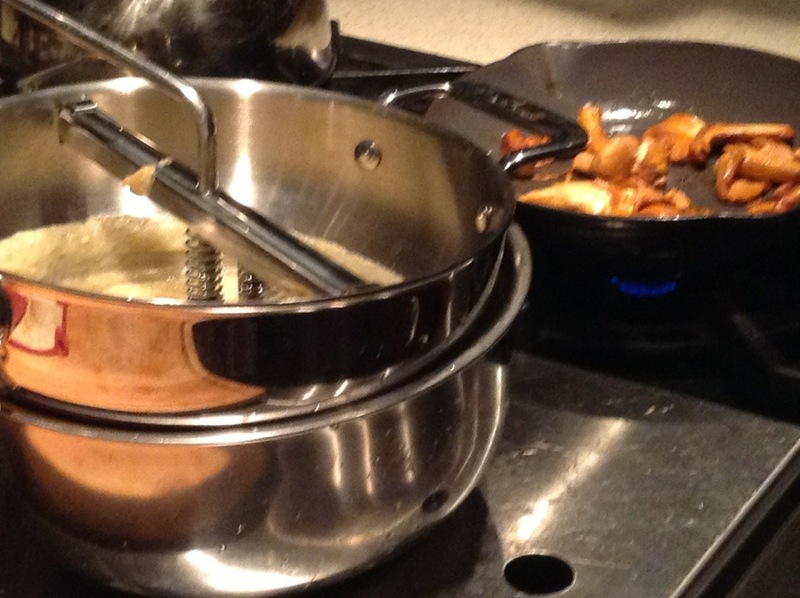 Put the cooking liquid (with chunks of diced vegetable) through a chinois (or use a strainer or food mill). Really press to squeeze all the flavor from the solids. This will be your sauce. If making this the day before you plan to eat it, wait on the above step. Let the contents of the pan cool to room temperature instead, cover and store it in the fridge. If any fat has congealed on the top when you retrieve it the next day, scrape it with a spoon and discard. Put the whole pan in a 350 degree oven and let heat through, approximately a 1/2 hour. Now continue with the step above. TO MAKE THE POLENTA add all but the cornmeal and cheese to a saucepan. Bring to a simmer over medium heat and slowly whisk in the cornmeal in a steady stream. Once all the cornmeal is in the pan, use a stir spoon to stir it continuously until it thickens and pulls away from the side of the pan, usually 5-7 minutes. Stir in the cheese and season if needed. I often make the polenta up to an hour before I am ready to serve just so I get it out of the way. I put it in my warming drawer but sitting over a double boiler works too, as does a reheat in the microwave; but with this option, a little added water is required. In warm pasta bowls, put down a spoon of polenta and place the lamb shank slightly askew. Tuck in the fennel and onion, a few carrots and spoon over a little sauce. And don’t forget to “throw a dog a bone” – carefully and with supervision. 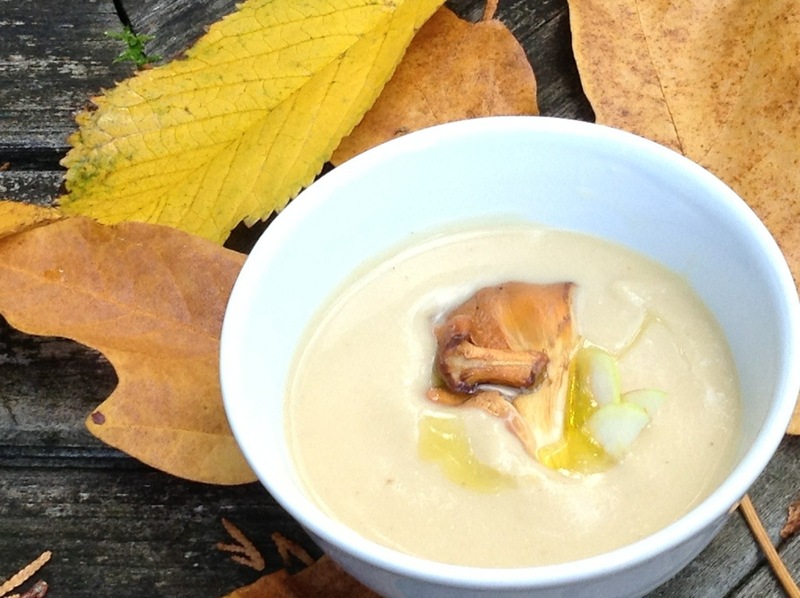 Driving through a thick mist of fog this morning, I think of soup. The air is crisp beyond the car and I can’t quite be sure that the sun will really creep in and overcome the haze. If it does, it will dance playfully off the colors of the leaves, bringing them to life with a warm, gentle glow. A shot of steam will also rise as the heat hits the morning dew; just as it would from a bowl of thick soup. I think of cauliflower soup. This matches my mood right now; colorless but complex. The bright golds and oranges of the leaves peak out from beneath the thickness of the white air that envelops them. It reminds me of chanterelles…and….perhaps squash, but mostly chanterelles. Vibrant and intense amongst a neutral backdrop yet neutral themselves when nestled into their true surroundings. I will flavor my soup with leeks and purée it until it is smooth and creamy. Yet I will use no cream. I will thicken it with a single potato instead; just enough so as not to overpower the nutty bitter notes that I am craving from the cauliflower. 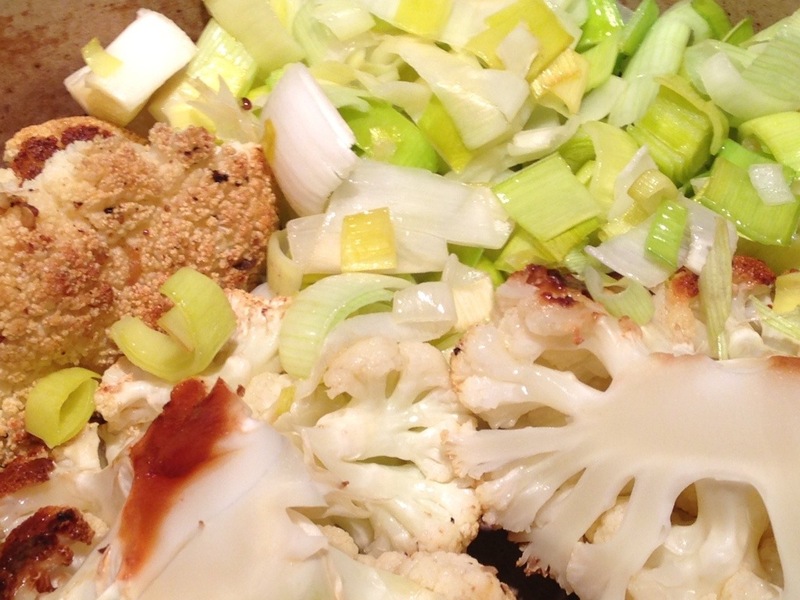 The cauliflower will first be roasted to deepen it’s earthiness, then finished in a bath of simmering stock. The stock will be made using the carcass left from my recently roasted chicken along with the stray vegetables begging to be released from the crisper drawer, and the empty corn cob sitting on the shelf above. I will pick the dirt carefully from the chanterelles and leave them whole to show off their bobbly shape. They will be slipped into a pan waiting with just enough oil to keep them from becoming dismantled by sticking to the pan. The heat will be low so as to coax out the flavor, intensified by the slightest additions of salt. Before they begin to discolor and droop, I will squeeze in some juice from the cut lemon that is often near my stove and if the mood strikes me I will douse them with Madeira to flavor them softly before evaporating into the air. Argan oil will replace truffle because I can taste the flavor as I think of this soup and know that it’s oddly unusual flavor will compliment the cauliflower without becoming too prominent. I wanted a velvety, pure soup so I took a few extra steps that aren’t necessary if your goal is to make a quick soup. In it’s thicker state, it is delicious as an accompaniment to steak or fish (which I actually used on Friday’s steak night, think – substitute for mash potatoes), which technically makes it a purée rather than a soup I suppose. The next day, I completed the process of making the actual soup, by adding some water, putting it through my food mill, then pressing it through my chinois. If you choose to go this route, push as much of it through as you can. You will be left with a thin soup which can go pack to the pan to be simmered gently. It will thicken and become even more aromatic until it reaches your desired consistency. When it comes to garnishing, there are so many options. I had my heart set on chanterelles and squash but when I didn’t find zucchini squash at the market, I settled on lady apple instead (a very small apple that seems like it would be tart but is actually quite sweet). In the end I decided to dice both the mushrooms and the apple, leaving only one small mushroom whole. I had a tangerine in my fruit bowl and decided to add a little of it’s zest. 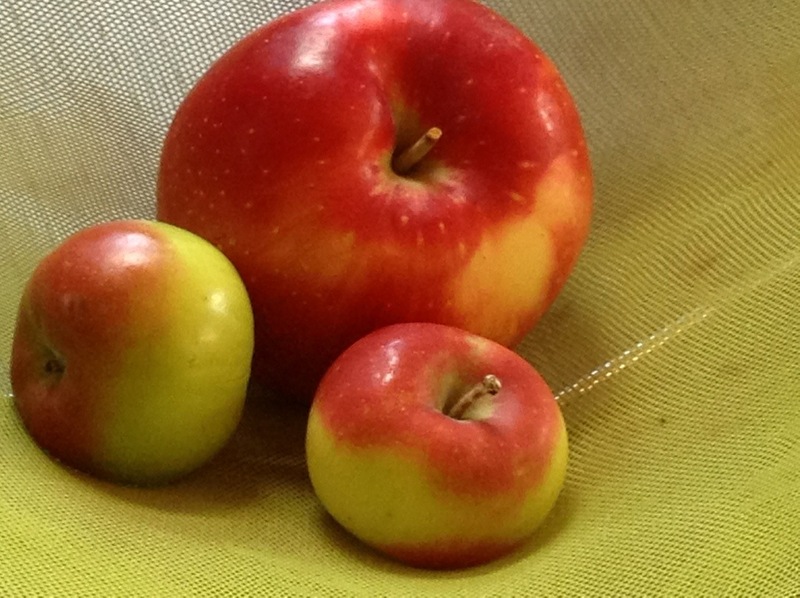 The apple and the zest lent a bright flavor that awakened my tongue and immediately made me smile. 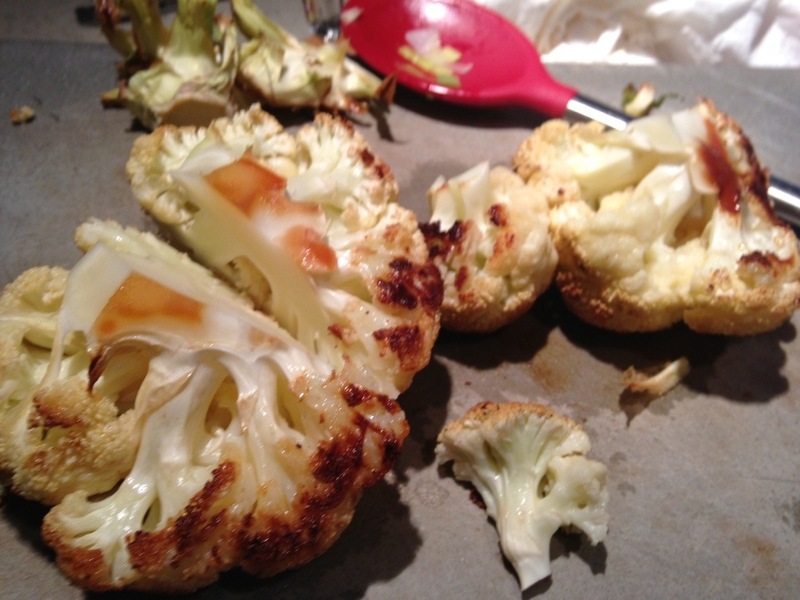 1 head cauliflower, outer leaves removed, sliced in half lengthwise and large stem discarded. 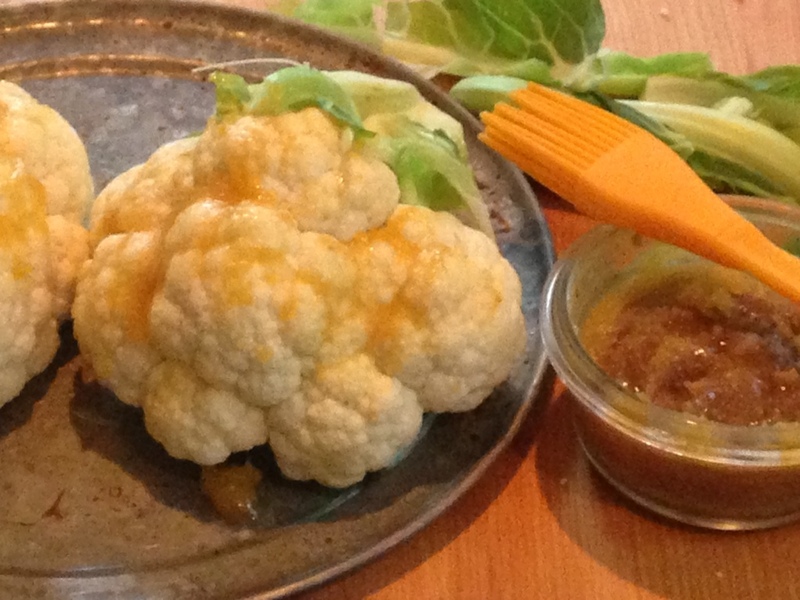 Olive oil to brush over cauliflower (or surplus juices/fat left from roast chicken). 1 medium small gold potato, cut into quarters and simmered in salted water until tender, drained and set aside (alternatively, you could replace the chicken stock using the water from cooking the potato). Chanterelles – pick ones you like the shape of for garnish. One medium per person or several small depending on what’s available or what you find most interesting. 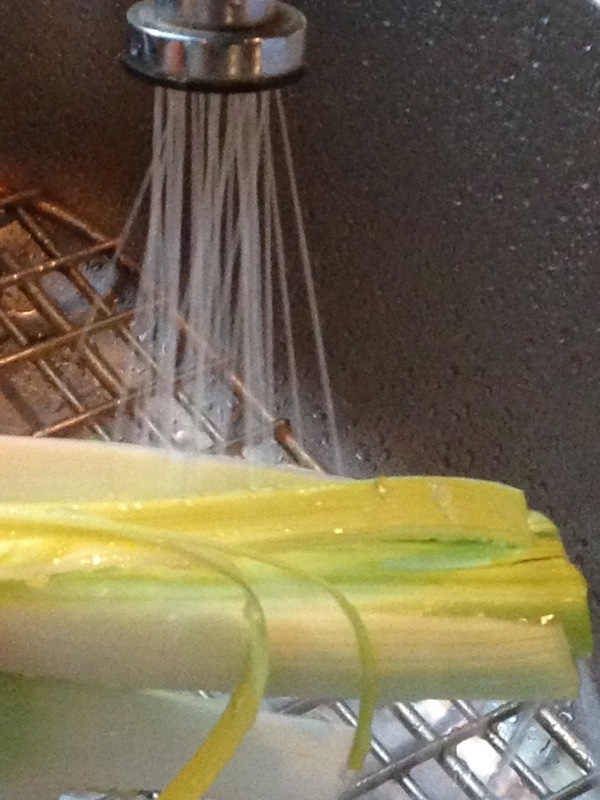 1 1/2 leeks, removed of the tough ends, cut in half down the length and rinsed of the dirt hidden between each layer. Cut horizontally into slices. 3 cups (+/-) chicken or vegetable stock – if you don’t have time to make stock or don’t want to bother, do try to buy a good quality stock and know that the seasonings will need adjusted up or down depending on salt content and flavor depth of the stock used, homemade or otherwise. 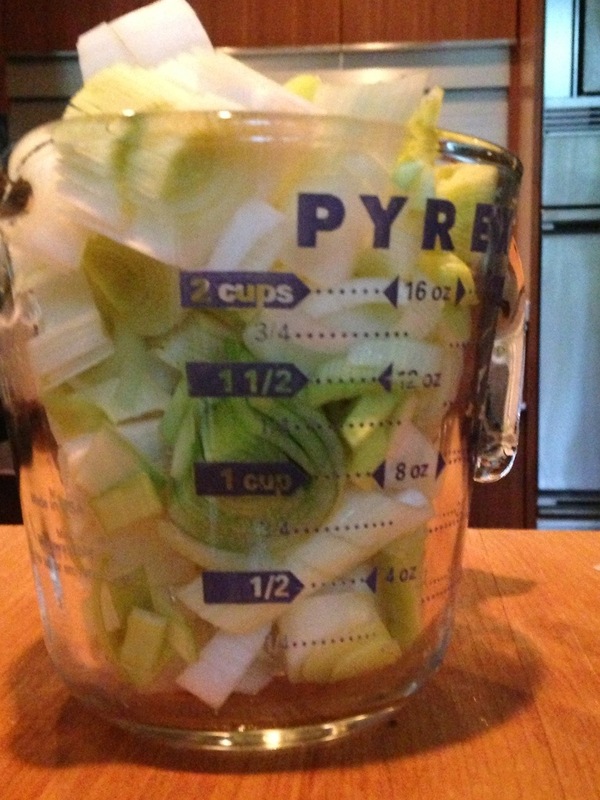 Water can also be substituted; the soup will have less depth but the color will be more white and pure. The quantity of liquid will need adjusting as it cooks so use your judgement. BRUSH the cauliflower with fat and roast in a 400 degree oven until fragrant, browned and tender, approximately 20 minutes. Meanwhile, while the cauliflower is roasting, COOK OFF the chanterelles by slowly sweating them in the olive oil over low heat, approximately 5-7 minutes. TOSS in a small pinch of sea salt midway through. When the chanterelles have started to relax and settle in, SQUEEZE in the lemon. Continue cooking until the juice dissipates, which will happen quickly. ADD the Madeira, if using, it too will absorb into the mushrooms and quickly disappear. SET THESE ASIDE. In a medium Dutch oven, softly sauté the leeks over low heat in the olive oil until beginning to wilt, 5 minutes or so. ADD THE CAULIFLOWER, potato and the stock (or water) to the pot; squeeze in the juice of the lemon. LET SIMMER until the flavors merge, another 10-15 minutes. 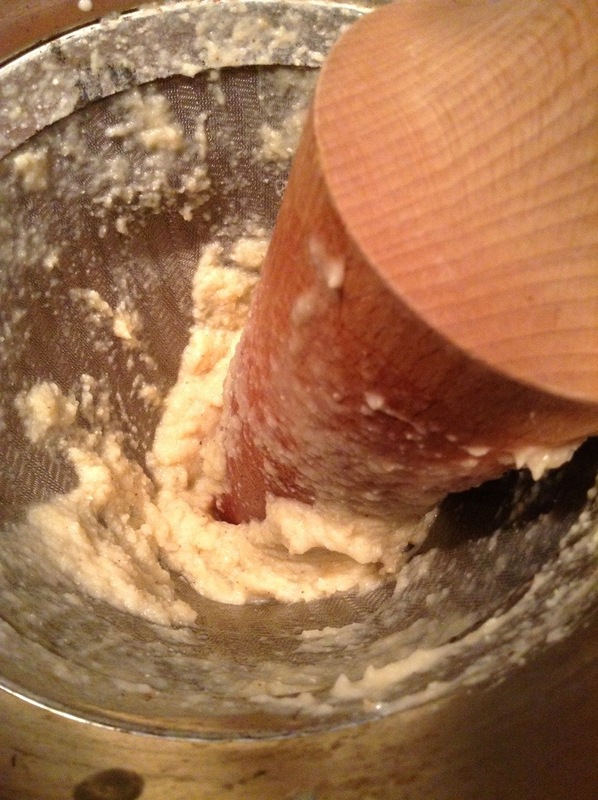 TRANSFER to a food processor or blender and PURÉE, adding more stock if it is too thick. Return to the pan and adjust seasonings. STIR in the yogurt (I didn’t have any so no yogurt in mine). then put into a chinois, pressing as much of the solids through as you can. It will be creamy but thin so to thicken it, return to the pan and simmer gently. As the soup simmers, REHEAT the mushrooms and then DICE all but the ones you plan to leave whole. DICE enough of the apple to yield approximately 1 TB for each person. 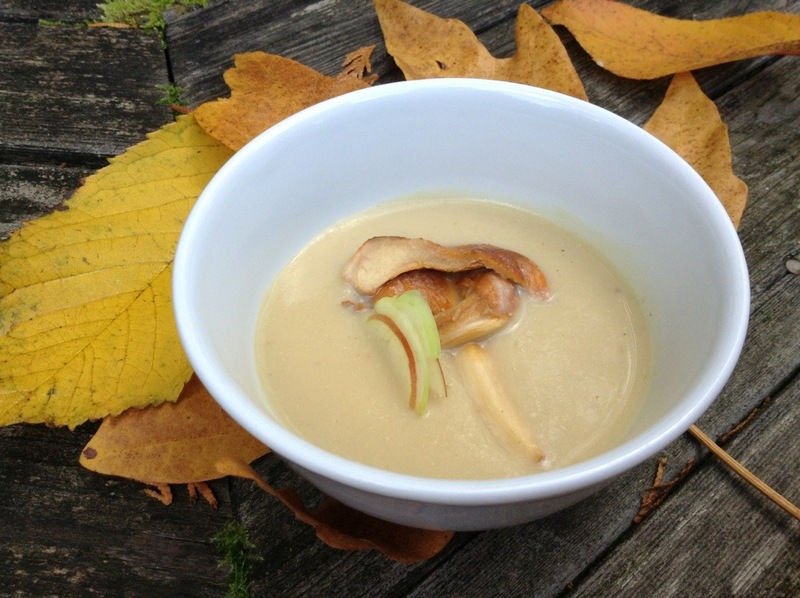 LADLE the soup into hot bowls or cups then carefully SPOON the mushrooms first, then the apple into the center of each bowl. They will sink into the liquid; top with the whole mushroom and garnish with a few thin slices of apple if you wish. 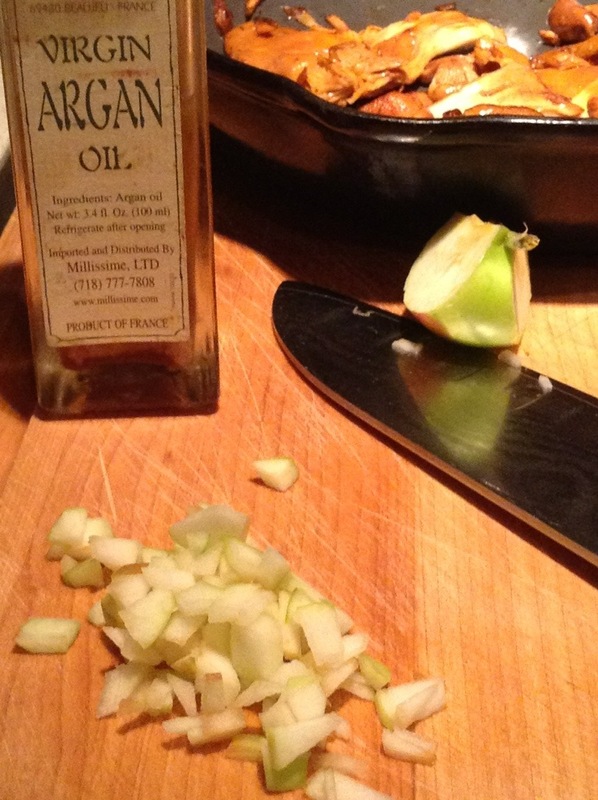 Grate in a little orange or tangerine zest, drizzle the oil around the edge and serve immediately.